Please refer to our stock # 1847 when inquiring. This luminous sky original regional landscape acrylic painting by a self learned painter in acrylic on canvas, depicting three towering trees with exposed roots growing out of the rocks. Even a colorful birch manages to make it out of an exposed crevice. Using a limited palette of 6 + white, the darkish rocks in a myriad of greens, sienna and purps make a dramatic juxtaposition with the buttery golden sky. 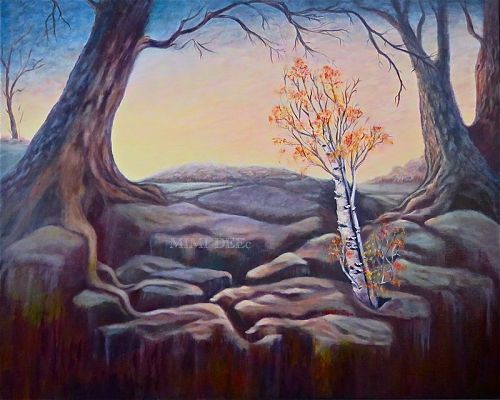 This scene is common throughout Cape Ann and the New England coastal and inland areas where one can see massive trees with exposed roots and birches growing out of or in between massive rocks, which here are painted with softened edges. Image: 24 x 30 x 1.5" deep in a wrap around canvas that needs no frame as the scene continues on all 4 sides. No frame allows for a more contemporary look with the traditional landscape. Title: Old Neighbors with ID #0402161004. Signed at lower right by this self representing painter as: Mimi Dee. No reproductions! Please call for shipping info. Free USPS priority/Ins/Track & Signature with your USA check or USPS MO. Original work by this artist who also forges hammered metalwork self adornments has been exhibited in various area artist association shows since the 90s and at the previously open Methuen studio store gallery by the same name.